Samuel Coates and I are currently in New York. It's part of a four week fact-finding tour of the English-speaking world that will include time in Canada and Australia. Sam is also going on to New Zealand. At the end of the four weeks we will be writing a number of essays on the health of conservatism in the Anglosphere. We spent some time today with the Giuliani campaign. ConservativeHome readers recently voted the former New York Mayor as their overwhelming favourite to be the next US President. Listed at the bottom of this note are his twelve key commitments to the American people. Giuliani will speak to a London event in early September as a guest of Liam Fox's Atlantic Bridge. Margaret Thatcher will also be present. It's quite a coup for Dr Fox and follows Fred Thompson's visit to London last month. A visit to Lady Thatcher now appears to be an essential component of any Republican hopeful's campaign. I will give Americans more control over and access to health care with affordable and portable free-market solutions. I will expand America's involvement in the global economy and strengthen our reputation around the world. If only we had some of Giuliani's tough approach to crime and security from the leadership of the British Tories. Some of his schtick is good - his crime fighting credentials and his commitment regarding judges spring to mind - but it's a shame he's proven himself an archetypal neocon with regards his number one promise, the issue he's building his whole campaign around. His reaction to Ron Paul's correct analysis of the nature of the terrorist threat against America shows up a dishonest, oppurtunistic individual, unreceptive to new ideas, and worst of all: wrong. We need a photo opportunity with Rudy & Boris. 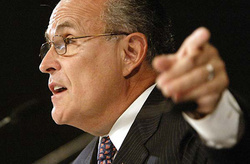 Giuliani is associated with the neo-con wing of US politics. Neo-con politicians are not similar to conservative politics, standing as they do for huge government, huge spending, extraordinary measures against individual rights and unprovoked ideology-driven foreign wars. For the latter, see Giuliani's recruitment of Norman Podhoretz, one of the 'thinkers' who helped embroil the US in Iraq and who has assured TV viewers (with a malignant chuckle) that President Bush will take the country to war with Iran before his term is up. Giuliani has a terrible personal and political record and it is a disgrace that the type of "COnservatives" who would support him have been / are allowed to take over the once great Tory party in this country. No wonder it's in meltdown.